Why should your clients be using a tanning lotion? 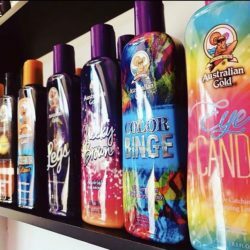 From not liking the fragrance, to believing that they tan better without it, there are so many reasons why your customers may believe they don’t need to use a professional tanning lotion. However, as someone working in the beauty industry, it’s your job to educate your clients otherwise. Explaining lotion benefits can have a positive impact on both salons and customers alike. 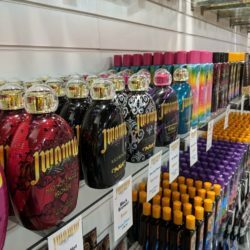 Not only will a better understanding of lotions improve clients’ tanning results and skin condition, but it will also help to build a trusting rapport between you and your customer. Once a customer sees the advice they have heeded genuinely brings improved results, your relationship will flourish. This can bring both increased trust and satisfaction from clients and boosted profits and reputation for salons. But how do we go about this? When faced with “I don’t like the feel of lotions” or “lotions make me go orange”, how do you overcome objections? By being able to explain how a lotion affects the skin, you can teach customers about skin health as well as how to maintain a deeper, darker, longer-lasting tan. Skin will become dehydrated, giving a dry, dull appearance. What’s more, dry skin reflects light, meaning your clients will then be unable to tan as effectively and may spend more time tanning only to achieve a lesser result. Lipids in the skin will become oxidised, resulting in cell damage. Skin proteins also become oxidised causing further skin damage. There will be a loss of elasticity in the skin, causing it to be less plump. A loss of collagen will speed up the ageing process. The production of free radicals on the skin will increase. This can damage the DNA in our skin and result in premature ageing. UV light can damage skin cells if a tanning lotion is not applied. What’s more, these damaged cells can affect circulation and cause a cellular imbalance, blocking the production and activity of enzymes. Simply put, this will affect melanin production, meaning clients won’t be able to get a dark tan easily. Additionally, by not applying a professional tanning lotion, customers are leaving their skin without protection designed specifically for the purpose of indoor tanning. These lotions regenerate, rejuvenate and nourish skin to encourage the best tan possible. 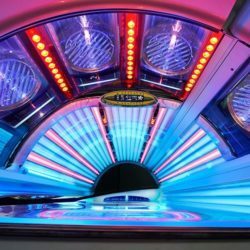 By forgoing these in favour of something which has not been designed with sunbeds in mind, or in favour of nothing at all, clients are opening themselves up to the risk of skin damage and premature ageing. So what can a lotion actually do to counterbalance all of these skin problems? Professional tanning lotions have been designed with all of the aforementioned consequences in mind. Therefore, they have been crammed full of antioxidants, vitamins, natural oils and moisturisers which work to improve skin condition. An increase in collagen synthesis, which will plump skin and combat the ageing process. Increased skin firmness, making skin look toned and tightened. The anti-wrinkle properties of professional tanning lotions, thanks to the high concentration of moisturising ingredients such as Shea Butter, Cocoa Butter and Natural Oils. Increased skin hydration, preventing a dry and dull appearance. The promotion of free radical scavenging, diminishing their presence on the skin and protecting from skin damage. Counteraction of inflammation to the skin. Prevention of protein and lipid oxidative damage, therefore improving overall skin condition. Increased enzyme synthesis, which makes skin more effective at tanning. No tanning odours, as tanning lotions have been designed to leave you feeling and smelling fresh. In fact, it has been proven that when a lotion is applied, you improve your tanning results by up to 50%. This does not even include the improved results that can be seen when clients apply lotions which include different bronzing agents. These help to personalise tanning results – be it a desire for a long-standing tan, or an event tanner looking for an instant hit of glowing colour for an event that evening, bronzers can provide great results for all tanners. For more information on how bronzers may benefit your clients, have a look at our blog, The Difference between Bronzers.